But not everything had changed about Sauber's ways, and what went on on-track in that same Melbourne weekend told us as much. The C34 was a car in the best of Sauber traditions, not stunningly innovative but neat, reliable and good to score points early in the year as others struggled to get their acts in order. That's roughly what happened, particularly with an amazing double points finish, P5 and P9, in that same opening Melbourne round. The much-improved Ferrari power unit lifted it up the order no doubt, but the chassis was also a big step forward. But it conformed to another time-honoured Sauber tradition, that the flipside of this approach is less development potential - while the Sauber team never has been that great at in-season progression - and a slide down the pecking order as the season goes on. That's roughly what happened too. Problems over bumps and kerbs, and some engineering inexperience on show by going down blind alleys in particular with Felipe Nasr's car, were more particular bugbears. It's hard to see how even that can be repeated in 2016 though. Sauber all alone didn't bring its challenger for the new season to the first pre-season test, and when it appeared for the second while the C35 was by no means a disaster - indeed some of its detail impressed onlookers - it appears in the mix at the back of the midfield, perhaps near to Haas or to McLaren and Lotus, rather than near the likes of Williams, Force India and the two Red Bull squads further ahead. Therefore to do something like it did 12 months it'll need attrition or else other unusual goings-on. And the trouble was the reliability throughout the field looked generally good in Barcelona. One wonders now with Haas on the scene and being de facto Ferrari B team how it will impact on Sauber too given for much of its history the Hinwil team has benefited from a close relationship. The car is an improvement though, and quickly dispelled waspish suggestions that Sauber might even struggle to beat the Manor. "It felt like we had a step forward on everything" said Nasr. 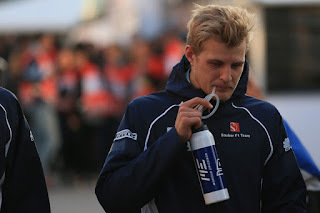 And his team mate Marcus Ericsson concurred: "With regard the engine there's definitely good potential there. The driveability has definitely improved. I also feel the braking stability has improved. On the aero side the car feels better in the high-speed corners, it feels stable". The team's new technical director Mark Smith is experienced and highly-rated and has spoken of changing the team's aerodynamic philosophy, but some of his words around the time of the latest car's launch revealed a lot of the compromises that face the Swiss squad. Smith explained that many newer pieces won't be ready for Melbourne and that the team has to plan very carefully when to use the resources involved in making such parts, as well as that such decisions are particularly acute with big regulation changes expected (but not yet firmed up) for 2017. With galling timing a report has emerged of staff salaries not being paid on time. 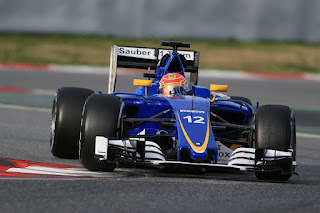 With its usual trick not in the magician's bag this time it seems, it's difficult to see what awaits for Sauber in 2016 beyond hopefully existing, and perhaps grabbing the occasional point or two. Marcus Ericsson's recent motor racing experience has been curious. He was quite the star in the making for much of his rise through the ranks, and though in GP2 his trajectory levelled off a bit there still was little to say he was anything other than a handy pilot. Yet now after two years in F1 - one at Caterham, one at Sauber - both campaigns have been cut from the same cloth. Spending a lot of the season in a struggle, making too many mistakes and there apparently only for the vast sponsorship cash he brings. But occasional signs too, particularly towards the season's end, that he might have something other than readies to give after all. Last year even with a season's experience over his team mate Ericsson started much more slowly. While Felipe Nasr was winning lots of new friends in the early rounds the Swede got nowhere near, and about the only time in that spell that he was on top, in Malaysia, he binned it on lap four... This would all have been regrettable enough but it's especially so in a Sauber which as outlined has long since tended to score most of its points early in a campaign. Something that dogged him throughout too was that he was often too slow, and lost places as a result, around pit stops. Things did improve for him however as the year went on and it peaked with three scores in a row between Hungary and Monza. After the Monza race he spoke eloquently about his improvement, that it was based on a focussed and analytical approach with his engineer to progress throughout the weekend in getting the car to his liking, rather than over-stretching when things didn't go his way early. Perhaps though his apparent improvement was amplified by his team mate's floundering at the same time. Rather confusing the matter further was that things weren't quite so good for him after that, but it took the harsher edge from the criticism he was receiving nevertheless. Ericsson appears a feisty racer, but some observers note a tendency to try too hard as well as a rather 'on-off switch' approach to accelerating and braking which isn't suited to the delicate Pirellis. It might go some way to explaining the recent plateauing of his career described at the outset. In 2016 he must learn to meet the thing halfway and thus prove that he can amount to something more than a passable driver with money. 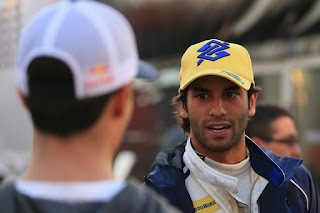 Felipe Nasr before getting his F1 break had been pacing outside the sport's front door for years. He also in that time had become another to divide views, and not merely because Banco do Brasil money seemed the chief discriminator to him getting the Sauber gig finally. His junior formulae CV contained success: Formula BMW and British F3 titles and then managing second place in Macau and third place in the GP2 table, and he also came in with plenty of F1 practice sessions for Williams under his belt. His CV also was pleasingly peripatetic, including a third place finish in the Daytona 24 hours... But there were those who in addition to his undoubted speed thought him frustrating and inconsistent. That it took him two years in GP2 of driving for top teams before he really got up to speed was thought a warning sign. The man himself has hinted however that the GP2 format of reversed grids and tyre choices didn't suit him and rather tainted how he was viewed. His F1 debut year in time rather conformed with the former view - that at his best he was fantastic yet there also were many troughs. The season started spectacularly. Not just that he got a wonderful fifth place result in his freshman race, but that in the early part of the year, Malaysia aside, he was excellent, with a smooth, flowing and calculating style - and a high priority of feel - reminiscent of Jenson Button or perhaps even of Carlos Reutemann. The team noted especially how he managed races in a mature fashion. Yes it was money that secured Nasr's seat, but he brought a lot of talent with it. But sometime around the season's one-third point he developed a problem with his car's brakes, both in not getting them to feel to his liking as well as in struggling to manage their temperatures and therefore their longevity in a race. It was something he wrestled with for months although in his defence having a rookie engineer who seemed equally flummoxed didn't help, neither did that they as part of it took the wrong turn on set-up. It took eventually a personnel reshuffle by the team to sort the matter out. And in Sochi at least Nasr made good on it with a superb fighting sixth place featuring great strategy calls from the cockpit when the safety car appeared. Yet all-in if he has great talent like Reutemann as well as rather exacting handling preferences like him, then you wonder if perhaps also like him that a bit too much falls out of his effort when that handling is not just so. It would explain a lot.